LaVoy Finicum Meeting that Never Happened | RANGEfire! It’s going to happen. Unfortunately, LaVoy won’t be there, but one year later, the previously intended meeting is going to happen. Background: According to an upcoming article in Range magazine, on January 26, 2016, while traveling with others from the lawful occupation at the Malheur National Wildlife Refuge in Harney County, Oregon to a public meeting with the Grant County Sheriff in John Day, Oregon, LaVoy Finicum was shot and killed by law enforcement, Ryan Bundy ended up with bullet shrapnel in his shoulder, and the other occupants of LaVoy’s vehicle ended up thoroughly terrorized. At this point we know that there were no arrest warrants, indictments, or probable cause for the stop. The other occupants of the vehicle were tried and acquitted of federal charges stemming from their actions at the Refuge. We also know that there is an ongoing investigation into an obvious cover-up by the FBI about its role in the fatal stop, including alleged efforts to escalate a full-fledged confrontation intended to result in a shoot-out that would produce even more casualties. In addition to LaVoy’s bullet-riddled pick-up truck, there is mounting evidence of an FBI plot to stage a provoked shoot-out intended to escalate into an even bigger massacre. In commemoration of the one-year anniversary of LaVoy’s death and the meeting in John Day that never happened, on Saturday, January 28, 2017, the Finicum family will be sponsoring “The Meeting with LaVoy that Never Happened” at the Grant County Fairgrounds in John Day, Oregon. The event will be from 4:30 – 10:30 PST. There is a great line-up of speakers, including Bill Norton from the Center for Self-Government, Constitutional Attorney, KrisAnne Hall, Rural Radio Guru, Trent Loos, Patriot Attorney, Morgan Philpot, Radio Personality, Kate Dalley, and champion of liberty, Garrett Smith. For more information and/or to register for the event, CLICK HERE. I will be talking about your Website today and tomorrow and Wednesday night as well as next week….I know LaVoy’s widow and the Bundy’s I served over 35 years in boots. I defended the right for Due Process and I see this country practicing anything but. I was at the Sugar Pine Mine in Oregon last year as well as visiting Harney county days before LaVoy was Murdered. He and the Bundy’s taught an outstanding and clear class on the Constitution, the Real one vs the two they have manipulated and made up. We talked about the Fourth Branch of Government that is not legit and was created by the Feds/NWO to enslave us financially and Physically. I am a talk show host with Revolution radio on Monday and Tuesday mornings in studio A and Wed nights in Studio B. I will be putting out info on the Event being sponsored by LaVoy’s family. My name is Vince Edwards. I’m the project coordinator of #PatriotCamp, and I’m currently covering a similar land-grabbing situation in Costilla County Colorado, which happens to involve the 20 acres that “camp 17” rests upon. Long story short much life and liberty has been spent so far dealing with this issue. 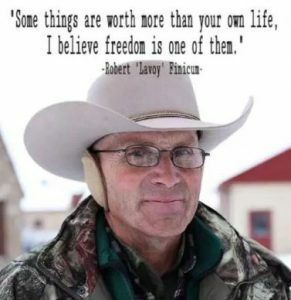 I am working on a documentary about Lavoy Finicum (and others) for the purpose of encouraging others to stand up and defend our constitution, hopefully before I become at best a martyr and at worst of course, forgotten. My dlive.tv/vinceableworld channel is going to be covering the most forward thinking strategies to restoring constitutional liberties, as well as showcasing those who have paid their liberty (many still in prison) or paid the ultimate price. I’ve cried enough times about what happened to Lavoy at the hands of the FBI to be qualified to cover this topic. I know of the WILDFIRE that would have started had Lavoy spoke at that meeting in John Day, which is why he HAD to be stopped by these nameless, faceless men who enjoy having absolute power. A sheriff in an adjoining county had established – according to the OREGON STATE POLICE: “a UN free zone” in other words he simply had declared that the constitution of this country was going to be followed. I’m sure most readers are unaware that the bulk of why Lavoy had to be MURDERED was because his presence at the meeting would have been very bad for the future of the United Nations and “Sustainable Development” AKA Agenda 21 in this country. I am hoping through education and understanding of the causes of our issues (ignorance of the constitution #1) #WeThePeople will realize it is UP TO US to restore the constitution by DEFENDING it, my strategy: Hundreds of “Patriot Camps” nationwide – 30 patriots per camp – 20 to jump on a bus with clipboards and cameras in order to protect someone’s right to DUE PROCESS BEFORE an IRREVERSIBLE constitutional violation takes place not to mention millions spent on prosecution of bogus cases. Bold solution. Big job. I think we can do it… will it work? Will a sledgehammer work on a thumb tack? I don’t want to take any chances. I have 1300+ subscribers currently on youtube (vinceableworld) however the response is so lethargic now due to the conservative crackdown I rarely ever use it anymore.